This weekend I got the urge to consolidate my code repositories. I got tired of having various projects strewn haphazardly across services like GitHub, Lighthouse, Sourceforge, and a few others. The code for all projects that I have decided to release to the public can now be conveniently found at projects.jonsview.com. I’ve opened up the wiki and issue tracker to anyone with an account (no activation required). If you stumble on a bug or have fixes to contribute back that is the place to go. You can even use OpenID so that you don’t have to remember yet another login. 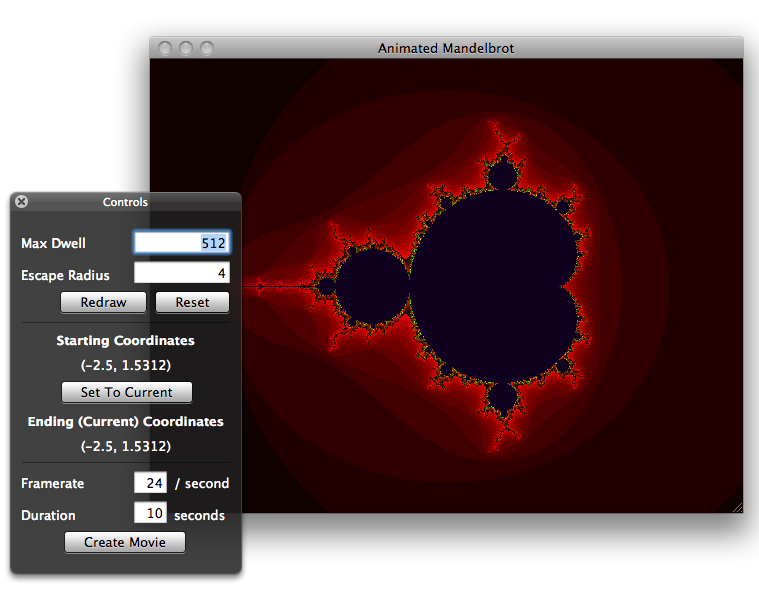 I’m pleased to announce the availability of Animated Mandelbrot. It is a multithreaded mandelbrot set viewer written in Objective-C for the Mac. I used this project to learn more about development of desktop applications on Apple’s Mac platform. A precompiled DMG image is available for OS X 10.5+ as well as full source code. What happened to project so and so? A had quite a few empty repositories that were simply namespace reservations. There wasn’t any useful code as part of these projects, so for now they are only privately available. If I have some time to actually work on some, have no fear that they’ll be made public.